Thomas Yeates’ illustrations have haunted my dreams for years. 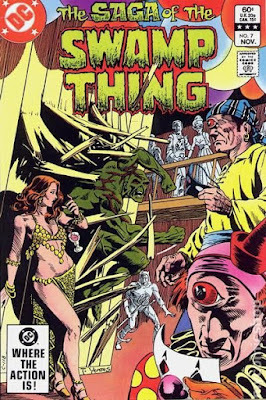 I first saw his Saga of the Swamp Thing #4 (1982) work in a DC Digest — this included the scary demon faces, the little girl running, and a white room. Seriously, buy it somewhere and I guarantee it will creep you out — in a good way. It’s like watching Nightmare On Elm Street for the first time and knowing “I shouldn’t be watching this, it’s freaking me out”, but you keep watching because it's so good. This began my life-long love for Swamp Thing and Tom Yeates art. Whether it was the punk rock vampires, one-eyed monster types at a party, or golems — they were images that remain classic for those of us who were lucky enough to read his run. 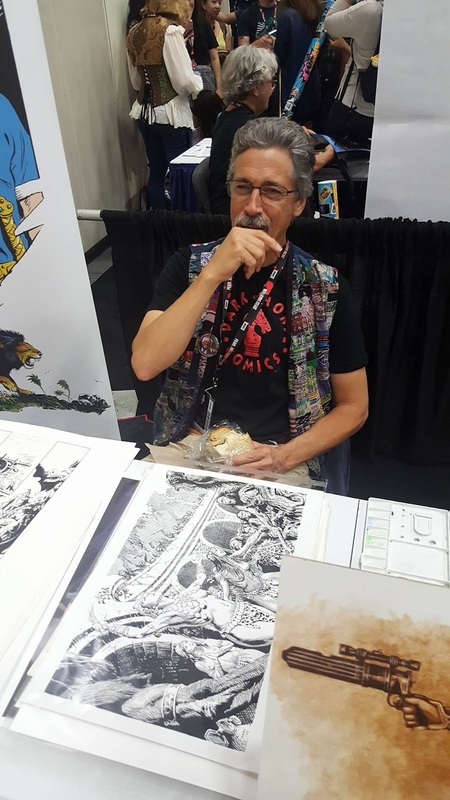 Now famous for Zorro and Prince Valiant, Yeates spoke to us at San Diego Comic Con about his breaking into comics after graduating from the Kubert School of Art, living with the other Swamp Thing artists, and why he ended up leaving the Saga of the Swamp Thing ongoing series. Still creepy to this day. Mark Belkin: Coming all the way from San Diego Comic Con, I'd like to welcome Thomas Yeates to our DC in the 80s interview. 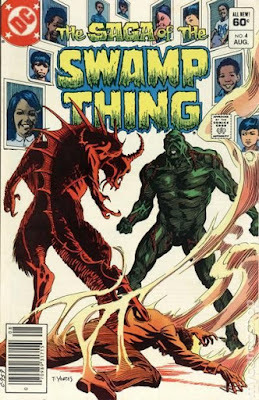 Today we're going to be talking a little bit about Yeates' time at The Kubert School, his work on some of the DC anthology comics during the late 70s/early 80s, his work on Saga of the Swamp Thing and further on. Could you tell us a little bit about your experiences at The Kubert School with the Rick Veitch class and John Totleben's class the year afterwards? What was the transition from graduating to working on the DC anthology books? Yeates: The way it happened, there was an implosion at DC where they actually did not have a lot of work when that first class at Joe Kubert School of Cartoon and Graphic Art graduated and went looking for work . Joe [Kubert] got us work in the books he was involved with — war books — doing back-up stories. But he didn't want us to sign them, claiming that we would thank him later. A lot of us, our very first work (Tom Mandrake, Ron Randall, Jan Duursema, Steve Bissette, Rick Veitch, myself and maybe a couple other guys) had work in there — in those books first. That was the first job that I kind of got on my own that had my name on it, I believe. Ghosts was past it's prime (as far as mystery books went) by this point. Mystery books are what got me interested in comics, and what I read as a teenager: Swamp Thing by Bernie Wrightson, House of Mystery, all that stuff. From there on, one thing led to another. They started the House of Mystery back-up, Karen Berger (I believe) was the editor and I did stories for her. Ross Andru was the editor up there for Warlord (a Mike Grell book) and he saw a short medieval story I had done for one of those books — Weird War Tales or something — he found a Xerox of it in trash in the copy room, and went around the editors with it saying "who's this artist?"... so that's how I met Ross Andru. I did some sword & sorcery back-up series' for him — I did two episodes of Claw the Barbarian and I did four episodes of an original back-up series with Paul Levitz called Dragonsword. That was the transition. Coming out of The Kubert School, it was very exciting. We all wanted to do wild stuff. Joe had showed us all these European comics: Moebius and all that kind of stuff. We went on to Heavy Metal and wanted to work there. But they of course didn't hire very many, they were all reprints from Europe. This went on for about a year and then... BANG! I just started getting work. Mark: Then you moved on to Saga of the Swamp Thing? Yeates: I really enjoyed doing the anthology stuff because you do the job and then it's done. So you get to have a break. With a regular book you have those deadlines that I felt were kind of crowding my freedom, like if I'm off at a rock concert or if I go camping or whatever. Mark: Where were you living? Yeates: Dover, NJ where Joe [Kubert] had his school. Myself and Totleben, Veitch and Bissette rented a house, kind of across the train tracks and into a little trail through the woods from the school. We would walk back and forth if we needed Xeroxes because they'd let use the fax machine. 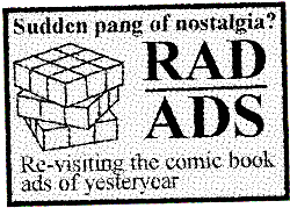 We'd visit them when they have guest lecturers — Will Eisner would talk or something would come up. We were there for a couple years and then Steve Bissette moved back to Vermont. He wasn’t getting a lot of work, he did some spectacular stuff for Archie Goodwin and various different companies but then it sort of, like, ran out of a marketplace. His work is... unusual. [laughs] My stuff, which — in my opinion — was nowhere near as creative or interesting or original, was nevertheless more commercial. So, anyways, Len Wein — I had done some short pieces for Len Wein and met him - and he was unfortunately suffering from writer's block at the time. But he said that he wanted to start Swamp Thing up again; if I would draw it, he would start it up again. It was very flattering, but again — I didn't want to do a monthly book. So I was very hesitant — it took me a while to decide to do it — of course it was very smart ultimately, because to this day more people know me for that one year run on Saga of the Swamp Thing than anything else I've done since. 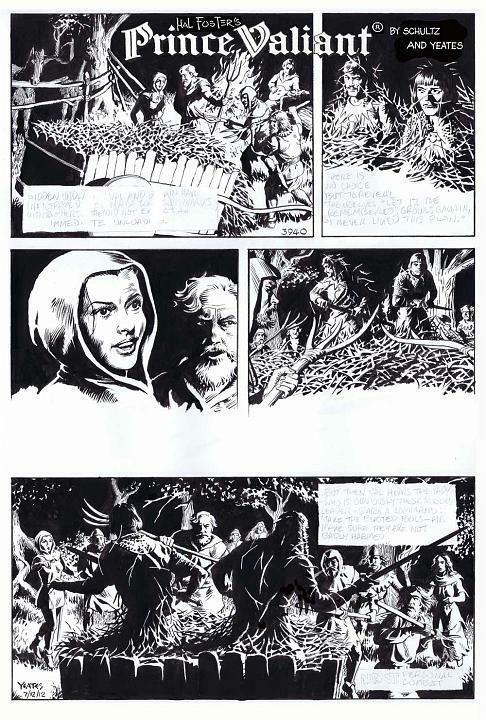 Actually, now that I'm doing the Prince Valiant strip... that's BIGGER than Swamp Thing. [laughs] I've done it long enough that it's starting to sink in — particularly outside of comics. Prince Valiant has millions of readers every Sunday — which is far more than any of my comics have ever had. Since 2012, Yeates has been doing amazing things with Prince Valiant. Mark: Your work was very spooky and scary on Saga of the Swamp Thing. What were the themes that you explored and what inspirations went into your Swamp Thing work? How did you work with Len Wein? Urgh, those one eyed Pirates are freaky. 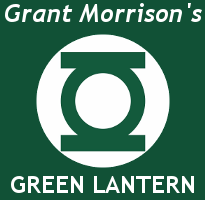 Mark: Would Len Wein make you come in and work in his office? I had heard that was something editors did if they worried about work being in on time. Yeates: I don't remember that issue. I do think I remember sketching in there. I wasn't great with deadlines, but I wasn't as bad as some. I got along great with Len. He was wonderful as an editor. I'm still always happy when I see him. He really had a lot of knowledge about what it took to create good comics and of course I loved his Swamp Thing. Bernie was drawing it and it was very seminal stuff for me — I was in high school reading comic books — riding my bike down to the drugstore to get the next issue. It was cool. That creepy part of the scripts kinda got to me, eventually. That's kinda why I left — I just didn't want to draw those stories. I wanted to go in some other directions too at that point. Mark: Did you recommend Steve Bissette and John Totleben for the book afterwards? Yeates: I told Stephen and John I was leaving, and they worked up samples and I passed them along to Len. Mark: Thanks so much for joining DC in the 80's today and talking about Swamp Thing. You can find Thomas Yeates' weekly Prince Valient feature on http://comicskingdom.com/prince-valiant/ and in newspapers across the United States. Rest in peace Mr. Wein.